At approximately 9 AM Smith and Crabb found Macho B trapped in an AZGFD snare. Below is an image of how they found him. 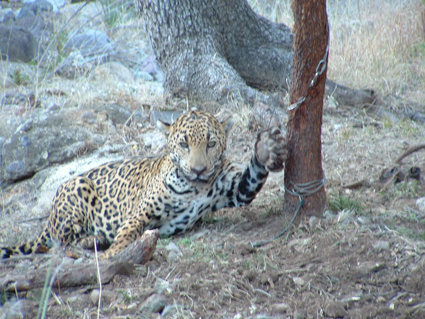 It is a difficult picture to decipher but in the black circle; Macho B’s front, left paw is attached to the tree while he lies prone on his right side, facing away from camera. 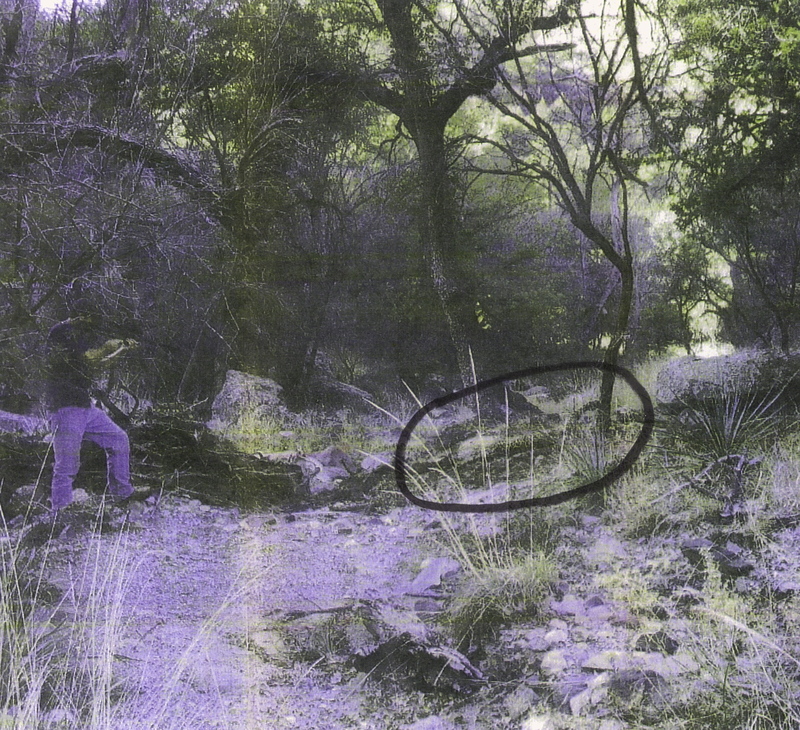 Outside of the black circle and to the left of the frame is Smith pointing the dart rifle at Macho B. At approximately 9:07 AM Macho B was darted with 400 mg of Telazol and according to Smith, “leapt to his feet, spun around, hissed and growled,” and Crabb or Smith took the photo below. After about 13 minutes, Macho B was hobbled to be weighed and have his temperature and other vitals taken. When it was discovered that Macho B’s temperature was four degrees below normal he was then placed on a sweatshirt to buffer him from the frosty ground and then laid out in the sun in an effort to warm him. 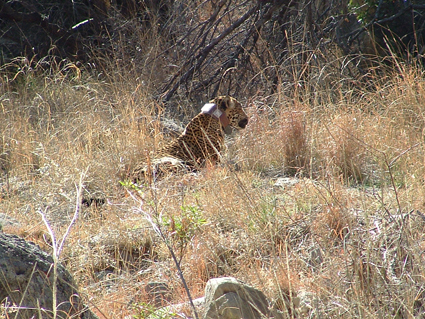 After six hours Macho B stumbled/walked away from his capture site; collared and ear-marked. Below is him after a stumble. Smith then called Bristow. 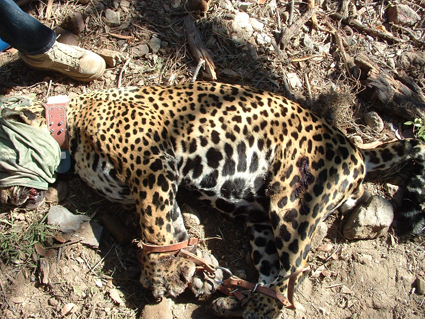 According to Bristow, he was “very surprised” to hear that Thorry had just collared a jaguar. 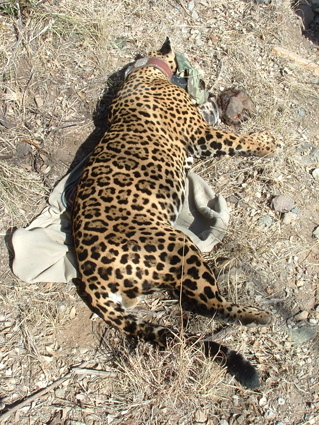 Bristow asked, “if Smith thought it was Macho B and he indicated it was.” Smith told Bristow, “he attached the jaguar collar that McCain had given him and he had removed the VHF transmitter for fear that someone with questionable motives might be able to get the frequency.” They then discussed general details of the capture. At some point, Smith and/or Crabb leave a phone message for McCain whom is on vacation in Spain.